This is the look I did on Friday night when I went out for a friend's birthday meal. It was really lovely and we had a great time. We went to a Chinese restaurant which I love, ordered a ton of yummy food and drank wine :) I did a look which was quick but I love the combo and my bf always complements it. Sennyo is one of my all-time favourite colours; it's bright but pretty, not to dark, not too blue, and goes with so many other eyeshadows. Hi Fi's In Bloom reminds me of Sugarpill's Dollipop, except loose. I sometimes use it instead because it's easier to get off for me. Dollipop can sometimes stain my eyelids a bit. I love Hi Fi's shadows so much, they're so soft and blendable and the shades are mostly unique :) Hope you like this look! P.S. I'm thinking of doing some more tutorials soon, maybe how to use glitter eyeliner, and how to wear bright coloured eyeshadow. Let me know if any of you are interested! So pretty! Love this combo! How I love Le Freak! Love the colour combo dood! I can't really pin exactly what it is that I really like about this look so much, but I do. The color choices appeal to me and I love anything with colored eyeliner. Very pretty. 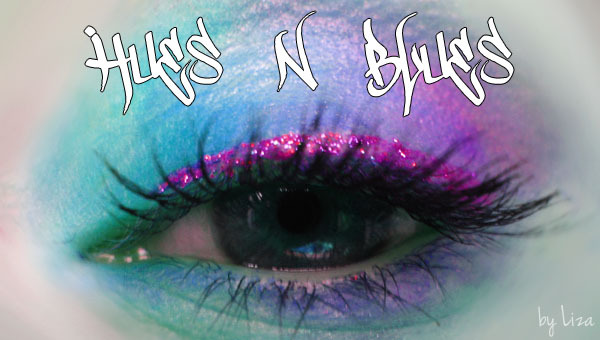 LOVE the blue eyeliner with this!!! I'd love to see some tutorials!